We devote a lot of time to researching success stories and educating readers about social media strategy. Along the way, we’ve discovered some remarkable campaigns and the creative brands behind them. And while there are dozens of one-hit wonders, there are some brands that get it right time and time again. One such brand is Burt’s Bees, a natural personal care company. We’ve mentioned Burt’s Bees in the past, but today we’re taking a much closer look at the brand’s social media strategy, from its cross-platform campaigns to its exceptional use of hashtags and video. We’ll also identify some key insights behind the brand’s efforts that can be applied to your own campaigns for similar buzz. To celebrate its 30th birthday, Burt’s Bees held a global Beeday event and invited its entire community to take part. The brand encouraged fans through Twitter and Facebook to submit their “Happy Beeday” wishes (to the bees, of course). Posts tagged with #BurtsBeeDay were then read aloud on the campaign’s dedicated microsite by company founder Burt Shavitz. Burt’s Bees also collaborated with bloggers and other influencers who used exclusive giveaways and recipes to encourage their communities to join the company in celebrating the milestone. As a result, Burt’s Bees received Beeday wishes from people around the globe. Key takeaway: A lot of energy goes into building a community, and it’s important that you also take time to celebrate yours. By having the company’s founder read birthday greetings from fans, it showed that Burt’s Bees wouldn’t be celebrating 30 years — a major milestone — without the support and passion of its customers. With 30 years of history behind it, Burt’s Bees has created a line of mainstay products with unrivaled fan affinity behind it. But with today’s market so enamored with the latest trends, the brand needed a new and interesting way to showcase its timeless products. Rather than promote the benefits and history of each product in long-form format, Burt’s Bees turned to Vine. This campaign quickly gained recognition from national media outlets, but more importantly it earned Burt’s Bees an entirely new online audience generating more than 2,000 likes, 580 Revines, and close to 1,000 new followers. Following that success, Burt’s Bees continued to incorporate video into its social strategy. In a new series called “Burt Learns Social,” we see the company’s founder receiving 20-to-30-second social media lessons. What’s makes these videos humorous is that Burt lives without Internet in Maine, but that doesn’t stop him from learning how to tweet. These videos build on the relationship established during Burt’s Beeday celebration and continues humanizing an already awesome brand. It also gives fans another reason to interact with the brand without products being the main focus. More recently, the company teamed up with husband-and-wife recording artists Us the Duo to create a series of lip balm-themed Vine videos. The #UncapFlavor campaign aims to reach millennials and is supported by paid tweets targeted by age, lip balm purchases, interests, and TV viewing habits. It’s also being promoted, unpaid, through the band’s and brand’s Twitter accounts. So far, the four Vines – the first of which debuted this past November — have amassed more than 114,000 likes, 24,205 Revines, and 1,371 comments. Burt’s Bees does more than just produce viral videos. The brand tried out something different to promote its new Brightening Line this past April. Rather than use the traditional social platforms, the company added promotional messages and reminders to people’s Yahoo, Google, Apple, or Microsoft calendars. 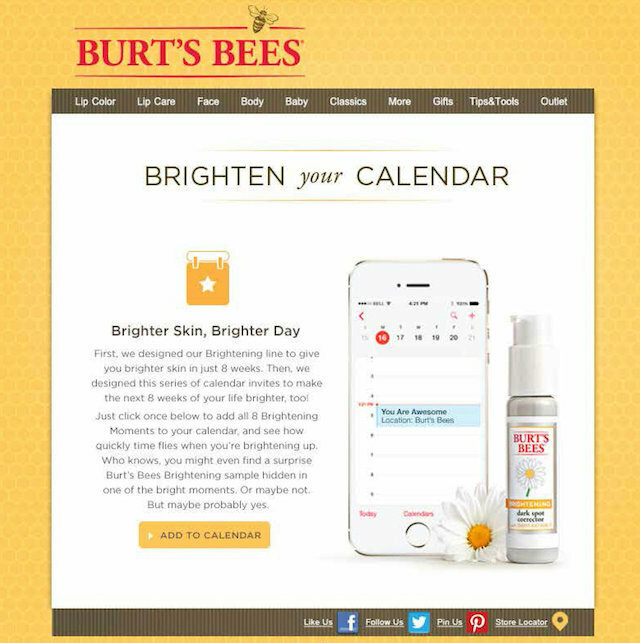 As part of the campaign, Burt’s Bees invited customers to click on a link that automatically added a series of eight weekly calendar items. Messages included items like “Meeting to Discuss Your Beautimousness.” The Brightening Line products weren’t mentioned until the fourth week, and during the final week customers were encouraged to claim a free product sample and download a $3 coupon. Key takeaway: Don’t be afraid to experiment with new social tools or reach new audiences. If a 30-year-old company like Burt’s Bees can find success on fresh platforms, you can too. Collaborating with influencers and creators can open up a world of new opportunities for social media teams. Don’t hesitate to explore your options and have some fun with your campaigns. Key takeaway: Limiting yourself to a single hashtag or only those associated with specific campaigns does more harm than good. Think about the keywords that your customers use to find your brand or products and turn them into hashtags on social media. For instance, Burt’s Bees regularly adds #natural and #lipbalm to its tweets. We don’t recommend blanketing your every tweet with those keyword hashtags, but the occasional appearance is encouraged. Burt’s Bees is just one of the dozens of brands doing incredible things with social media. Although you might approach your campaigns differently, there are underlying themes here that can be applied. Talk them over with your team and see how Burt’s approach might inspire you.